NiteRider Technical Lighting Systems creates new lighting system destined to generate all-time high performance records and send competitors scurrying back into the dark. It could be named after the legendary Mecca of mountain bikes, but the new Moab Lighting System is actually named after the battery pack that gives it power beyond anything ever seen in the marketplace. The system is built around the Mother Of All Batteries, a new 18-ounce, 7.2Ah Lithium-Ion pack. The Moab HID+LED System boasts an unheard of runtime of up to 12 hours utilizing its three brightness levels, while the integrated LEDs will burn for 720 hours on a full charge. 24 Hour endurance racers can now ride solo from dusk until dawn on one battery. This kind of technology could be seen as an unfair advantage for those smart enough to purchase a Moab light system. It is not an exaggeration to state that the technology will likely lead to faster race times as transitions and lap times will certainly get faster and faster without the need to change or charge batteries constantly. Even with a slightly greater total system cost, riders will be able to save money by not needing to invest in multiple batteries and charging systems. The Moab system also boasts a charge time of just 4.5 hours, if it is ever fully drained, new gold-plated connectors for long lasting performance and to aid in the systems versatility both a helmet and handlebar mount are included. 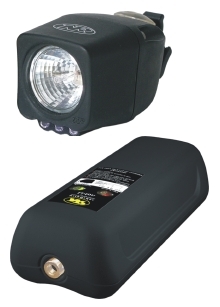 With its feathery weight, incredible burn-times, and overall versatility the 2006 NiteRider Moab HID+LED light system has set a tough new standard in the endurance lighting market.